When you are developing an application with a new database design (or an existing database design, but you didn't get any data), it can be handy to quickly create some test data in your tables. Sure you can create some data manual to test your input forms, but what if you need more data? Or you want to test the performance with a large amounts of records. You could also create a little procedure that populates your tables with it as you probably have some relationships going on as well (PK-FK). I just needed a select that generates me huge amount of records to test some charts in APEX with. Today Anychart released version 5.1 of their charting product. I really looked forward to this release as it has some really nice features in! We are currently working hard to get it compatible with the APEX integration kit, so if you're using this together with our kit, you'll need to wait a bit longer before doing the upgrade. Heatmap Charts, allows you to give graphical representation of data where the values taken by a variable in a two-dimensional map are represented as colors. If you hover the legend the right numbers light up. Feature rich Funnel Charts both in 2D and 3D, smart labeling, animation, neck control and man more option. Nice looking, interactive 3D Pie Charts and 3D Doughnut Charts with Animation and all features of regular flat Pie and Doughnut Charts. There are a lot of other nice features like Multiple X-Axis Support, One or more Interactive Labels or Tooltips, a combination of any chart type in a Dashboard etc. The complete list of changes you find here. But as a last one... some people told me they would like to have better performance in their charts. Anychart 5.1 will help you with that! PS: If you want to buy Anychart 5.1 you can still use the coupon code APEX15 to get a 15% discount! The UK APEX SIG is kicking off with a one day free seminar on Friday 13th February in the Oracle City Office in London. We'll finish the day with an Apex Forum where you can ask any question... and then the bar! Update from UKOUG: If you are a UKOUG member you can attend for free. But there is a non-member rate set up of £160 plus VAT. As members of UKOUG you get one space per membership free, then any additional places are charged the members rate of £80 plus VAT. 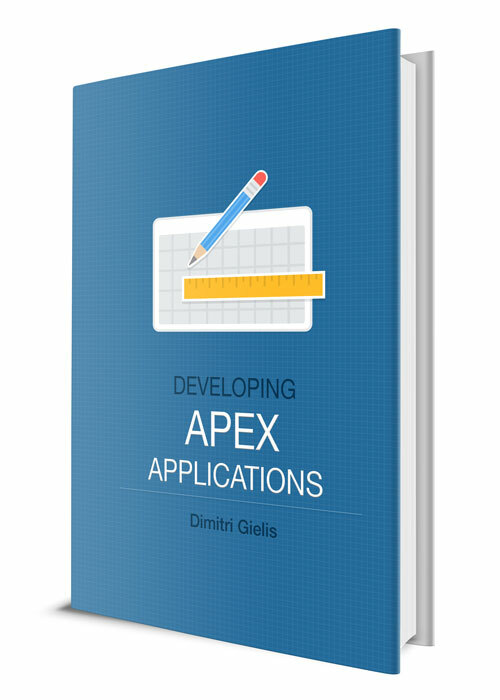 PS: We got some questions if our 3-day European APEX Training Days of March are still on? The answer is yes! We're handling the last details for the location (will be in Manchester, UK). More information will follow shortly. Recently we had some issues with JQuery UI which didn't render the widgets correctly. If you want to change the look and feel of the date picker (or any other widget) you can do that by creating a new theme on the ThemeRoller site or by selecting one of the gallery. 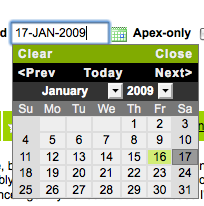 However while we did that our datepicker became transparent and it looked like it couldn't find the css or the background images anymore. As we already used it in more projects, we were sure our code was right. Finally we found that a different version of the JQuery UI can get you into that situation. The fix then is to use the version you know your css works with or to download the latest version of JQuery UI and create the theme again from the site and use that instead.